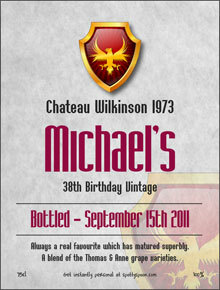 Stylish Birthday Wine Label. 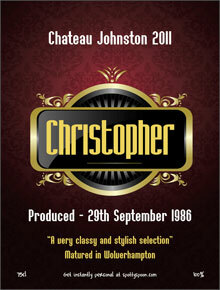 A Family Crest image to create an aristocratic family vineyard label. This label design is a favourite with customers. 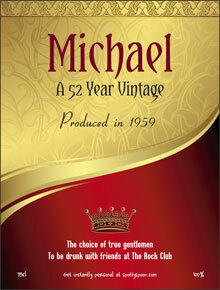 It has a classic wine label feel which leaves a strong impression. 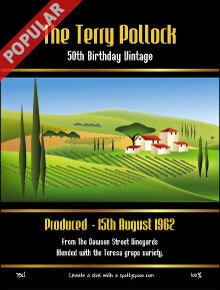 It is perfect for all ages from 18 to 80, but is most popular for 40 & 50 year olds birthdays. The faded background looks aged and weathered - like the recipient perhaps. It is also a favourite with home brewers would make their own wine or beer and would like to have their own brand on the bottle. Follow the example text and you can not go wrong - 'Produce of (the year born)' 'Bottled in (the current year), 'Blended with (husband or wife's name) etc. Fantastic product, so original & personal. Received the labels very quickly. Very pleased with your service. Quick delivery. Ordered for 50th birthday and everybody highly delighted. Will order again. Thanks.